I finished reading Skylights by Luther M. Siler a week or two ago. Siler was the first indie author I followed when I joined WordPress three years ago. I’ve been intending to read this book for forever, and boy am I glad I got around to it. Luther, if you’re reading this, sorry it took me so long. SKYLIGHTS is a fun, fast-paced romp through a not-too-distant future where humans are beginning to explore Mars. Drawing on real mysteries of the Martian surface and atmosphere, Luther M. Siler’s story imagines believable technology without bogging down the story in scientific jargon. The dialogue is engaging and witty, and the characters interact like friends on an extended road trip. I think this brings a natural, relatable flow to the dialogue. For as quickly as this book moves through its narrative, the first half of is spent preparing for the journey to Mars. In a lot of books, this would be boring and kind of yada-yada for the reader waiting to get to the adventure. But with the protagonist Gabriel’s sarcastic comments and the necessary exposition of the equipment and mission parameters, I found myself surprised at how quickly I pored through the first several chapters. Gabriel, a journalist, must essentially learn how to be an astronaut in a matter of weeks, and this process is a whirlwind for both him and the reader. And it’s completely necessary. Siler does not spend much time on detailed descriptions once Gabriel and his history-making crew-mates touch down on Mars. Instead, the narrative is action-packed, and Siler does not have to waste any time explaining what a HUD (heads-up display) is, or how the crew of the Johannes plan to land, camp, and then take off again from Mars. 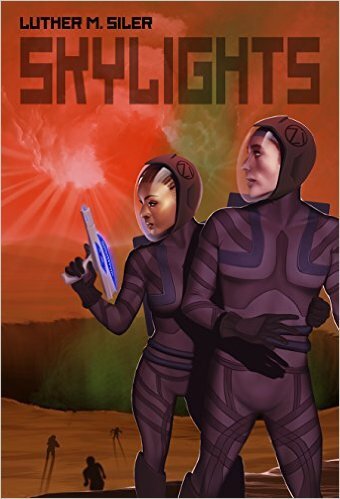 Overall, SKYLIGHTS is an exhilarating sci-fi adventure with more than a few surprises in store. It definitely sets up for potential sequels without leaving the story incomplete. Also, I’m convinced that the iLid will one day be a real social media device, and we will all be “blinking” each other smartass remarks all day. TLDR: I really enjoyed it.